Members of the Cathedral Church at Kohima observe Palm Sunday, on April 14 in Kohima town. 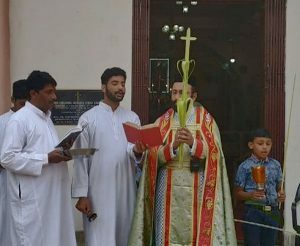 Dimapur, April 14 (EMN): Symbolising the triumphant entry of Jesus Christ into Jerusalem, the St. Xavier Catholic Church at Kidima village in Kohima observed Palm Sunday by going on a procession from Thokhwezu to the church on April 14. According to the Catholics, the holy week begins from Palm Sunday which is observed and worshipped with devotion and confession; and then to the Last Supper of the Lord with his apostles; washing of the apostles’ feet; Jesus’ prayer at Gethsemane; the crucifixion of Jesus and the resurrection of Jesus Christ. Reading on the passion of Christ, Holy Mass, and singing the hymns were the highlights of the daylong celebrations, it was informed. 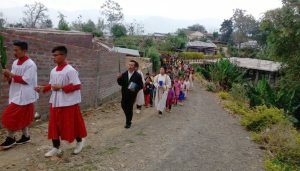 Members of St. Xavier Catholic Church at Kidima village seen here in a procession from Thokhwezu to the church, symbolising the triumphant entry of Jesus Christ into Jerusalem, on April 14 in Kohima. In a similar programme, members of the Cathedral Church at Kohima celebrated Palm Sunday on April 14 at the PHQ junction in Kohima. The celebration was marked by prayers and Bible reading among others, it was informed. People shared in the joy of proclaiming the glorious entry of Jesus Christ into Jerusalem, by singing ‘Hosanna’ and holding Palm leaves, the updates stated. The procession took place at 9:00 am at the police headquarters and culminating at the cathedral. Christ King Church in Kohima village also celebrated Palm Sunday on April. Fr. Paul, parish priest of Christ King parish at Kohima village, was the main celebrant, it was informed. Elsewhere in Dimapur, the MGOS church at Midland celebrated Palm Sunday on April 14 with the faithful. There was a special Palm Sunday service from 8:00 am to 12:00 noon with a procession and a Holy Communion, updates from the church’s media cell informed on Sunday. In the city of Jerusalem, people gave a royal reception to Lord Jesus. It is the remembrance of that great day. By celebrating all the historical events, the church and devotees try to have an experience with Christ and his redemptive economy in this world,’ the updates stated. The church’s media cell informed that there would be prayers every day at 5:45pm on Passion Week. On Maundy Thursday, the updates stated, prayers will start at 5:00 am followed by Paschal Service. On Good Friday, morning prayers will start at 9:00 am to 3:00 pm. Leaders of MGOS church celebrate Palm Sunday on April 14 at Midland in Dimapur. On Gospel Saturday, there will be a Holy Communion at 9:30 while the Easter service will be starting early morning at 5:00 am on Sunday, the updates stated. In Kohima, the Kerala Christian congregation will be led by Rev. Fr. Jojo Joseph in all the Passion Week services, the updates informed. Palm Sunday is a Christian feast that falls on the Sunday before Easter. The feast commemorates Jesus’ triumphal entry into Jerusalem, an event mentioned in each of the four canonical Gospels. In most liturgical churches Palm Sunday is celebrated by the blessing and distribution of palm branches or the branches of other native trees representing the palm branches the crowd scattered in front of Christ as he rode into Jerusalem. The difficulty of procuring palms in unfavourable climates led to their substitution with branches of native trees, including box, olive, willow, and yew. 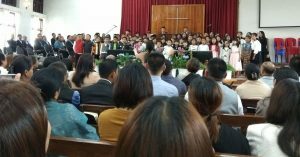 Cantamus Choir performs ‘Calvary says it all’ on Palm Sunday, April 14, at the Chakhesang Baptist Church at Ministers’ Hill in Kohima town. The Sunday was often named after these substitute trees, as in Yew Sunday, or by the general term Branch Sunday.